The Cork Samaritans are a 100% voluntary organisation, with no paid staff or government funding. The Samaritans rely solely on donations and fundraising initiatives from the general public and corporations to help raise much needed funds to keep the charity running. All money donated to Cork Samaritans is used to keep the branch open and deliver the listening service to those experiencing difficulties in life. ‘Talk To Us’. The Samaritans also provide support services through email, SMS and letters. With 21 branches in Ireland the Cork branch is one of the busiest and largest centres in Ireland with over 220 active volunteers of all ages. Every year the Cork branch receives approximately 36,000 calls, with over 1000 people calling in to the centre for support. Information & awareness days for Schools/Colleges and Community groups. Listener Scheme with Cork prison. This year Exigent Networks carried out a number of fundraising events to help raise much needed funds for the Samaritans Exigent Networks raised over €10,000 for the Cork Samaritans . We had over 45 people climb the highest mountain in Ireland Carrauntoohil and also ran in the Cork City Marathon. 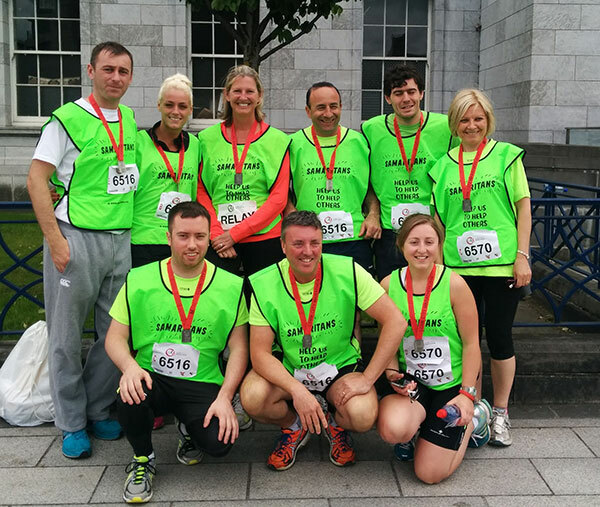 The Samaritans are available 24/7/365 days a year.Our first fundraising event was the Cork City Marathon, we entered two teams into the relay. We are looking forward to the year ahead and the other fundraising initiatives that we have planned.